"No self respecting Tamil would enter the next parliament if a just and permanent solution is not found to the Tamil national question by this parliament," declared Mr. R. Sampanthan, MP, the parliamentary group leader of the Tamil National Alliance (TNA), speaking at the inaugural ceremony of the 12th parliament Wednesday. Mr. Joseph Michael Perera of the ruling UNF was unanimously elected Speaker of the 12th parliament when it was ceremoniously inaugurated Wednesday morning. Congratulating the new Speaker on behalf of the TNA, Mr. Sampanthan who spoke in Tamil said: "the TNA believes that the United National Front (UNF) government led by Prime Minister Mr. Ranil Wickremasinghe would take concrete steps to find a permanent solution to the Tamil national question which remains unresolved for the last fifty three years. The TNA would extend its fullest co-operation to the UNF government if it takes sincere steps to find a just political solution to the Tamil national question. 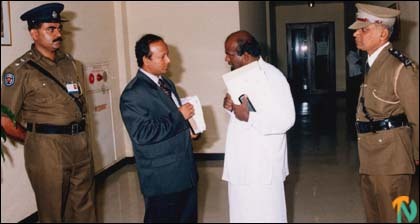 The major challenge now facing the new parliament is to find a political solution to the Tamil question." "The franchise of more than one hundred thousand Tamil voters was robbed in the Vanni and Batticaloa districts on December 5, the election day," Mr. Sampanthan said. He said that he was bringing this matter to the notice of the international community. He appealed to the government to take stern measures against those who unleashed violence against the TNA candidates in the Jaffna district during the election campaign. 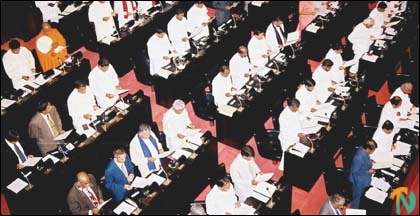 Prime Minister Mr.Ranil Wickremasinghe, the Opposition Leader Mr.Ratnasiri Wickremanayake and leaders of several political parties also felicitated the new Speaker. 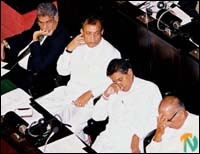 The parliament was adjourned till 8th January 2002.